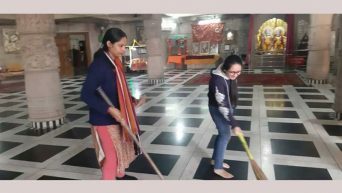 Department of Business Studies, Faculty of Commerce and Business Studies (FCBS) organized Cleanliness Drive at Shiv Mandir, Sainik Colony today under the aegis of Dr. O.P. Bhalla Foundation. 21 students from the department along with 4 faculty members participated in the drive. Students’ participation helped in inculcating the habit of cleanliness in them, that should not be restricted to houses but should keep in mind the surroundings too.